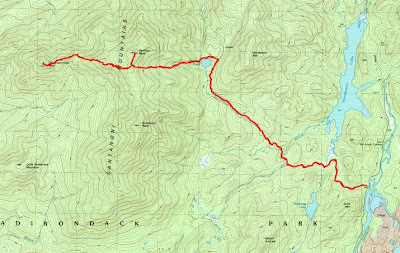 I was hoping to climb all 3 peaks in the Santanoni Range on Sunday (Santanoni, Panther and Couchsachraga), but I had my doubts, since the trail from the snowstorm of Friday might still be untracked. I knew several other groups were headed that way, so I hoped we could take turns breaking trail. Leesa, Rev and I pulled into the parking lot at about 7:15 right as two other cars pulled in. 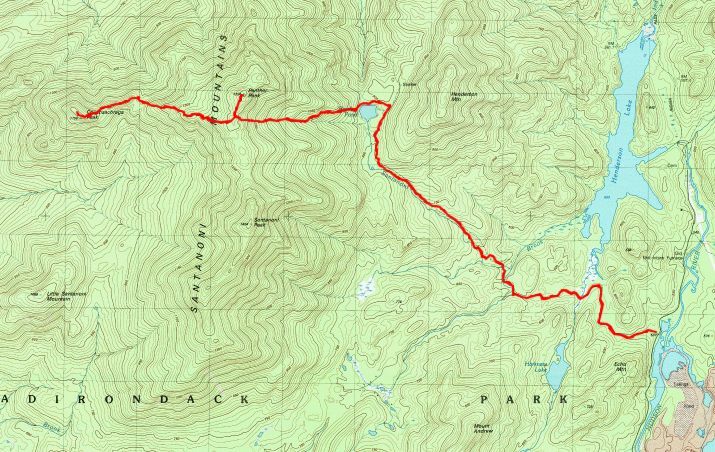 It turned out to be "MooseBeware" and "The Tandem" of the ADK High Peaks forum. Both were hoping to climb all 3 as well. MooseBeware headed off on her skis for the first portion of the trek. We were a couple minutes behind, and "The Tandem" were gearing up when we headed out. It was -16 degrees when we started out, but it was supposed to warm quickly into the low twenties. I'm not going that way! Two cars were in the lot when we got there, and they looked like they had been there overnight. The trail was broken all the way up to Herald Square. Leesa and I arrived there at about 11:45, then went over to Panther. A few braids were sorted out and we were on the summit before noon. Back at Herald Square, Leesa had decided to head back. I told her I planned to do Couchsachraga and then I'd decide if I wanted to continue on to Santanoni or not. Rev wanted to stay with me. At the point, MooseBeware popped into Herald Square after losing a little confidence in finding the herd path to Couch. Leesa headed down and MooseBeware, Rev and I went to tackle Couch. It was about 12:15. Rev knew exactly where to go, and I followed her, breaking trail since she didn't do such a good job. MooseBeware followed us and we made pretty good progress, getting to Couch at about 1:45. This is where things turned interesting. Rev and I ate a quick lunch on Couch, then MooseBeware was anxious to head out. We started back and got to the Couchie swamp when Rev decided to follow her nose off trail. I told MooseBeware to continue ahead while I went in search of Rev. Having no luck, I very regretfully started back. Rev has done this to me 4 or 5 times before. She is a hound and you can't change her. I started back up to Times Square dragging Rev's coat and my hat to give her a scent to follow. About 1/2 way back to Times Square I ran into the couple "The Tandem" from the forum. They were heading in to Couch and they had their headlamps ready, knowing they would be getting out after dark. They said that if they saw Rev, they would try to get her out with them. I continued on, and caught up to MooseBeware at Herald Square. It was now 3:15. She decided Couch was enough for today and I wasn't going to do Santa, since I was hoping Rev would catch up to me. MooseBeware and I descended together to Bradley Pond (it was less than an hour going down). She stopped for a minute at the Beaver Pond and I continued on. I got back to the car at 5:30. Still no Rev. Leesa was very upset, of course, as was I. The Couchie swamp is no place to lose a dog. After a few minutes MooseBeware came out on her skis. She packed up and headed out. Wouldn't you know it, at 6:30, Rev came trotting out on her own! She had been lost from me since 2 and she had come from the Couchie Swamp back to the trailhead, following my tracks and scent. During the last hour, she was moving in the dark. To say the least, we were both overjoyed. We gave her her dinner and she was asleep for the ride home. I'll still have to go back to get Santanoni, but the mountain will always be there. I got my Rev Back. MooseBeware - Nice hiking with you. Sorry the whole dog event put a damper on the day. Hope to hike with you again with no dog drama. The Tandem - Thanks for your willingness to try and get Rev back. Hope to see you on the trail in the future. Wow you are really knocking off the winter peaks! Enjoyed the trip report and I always love photos of the Adirondacks in winter. Those pics from Couchie do a good job of showing just how far it is from Santanoni and Panther. Close call with Rev, I am REALLY glad it worked out fine! Thanks. With any luck from the weather gods, I'm hoping to finish my winter round next month. Nice trip report and happy to hear you were reunited with Rev. I am wondering how you are able to drop your gps track on the Nat Geo map and also the other topo. I have just started experimenting with Garmin Base Camp but not yet proficient. Do you use Base Camp or a similar program? As far as the maps, I just drew the route on the Nat Geo map. The topo is my track imported into CalTopo. 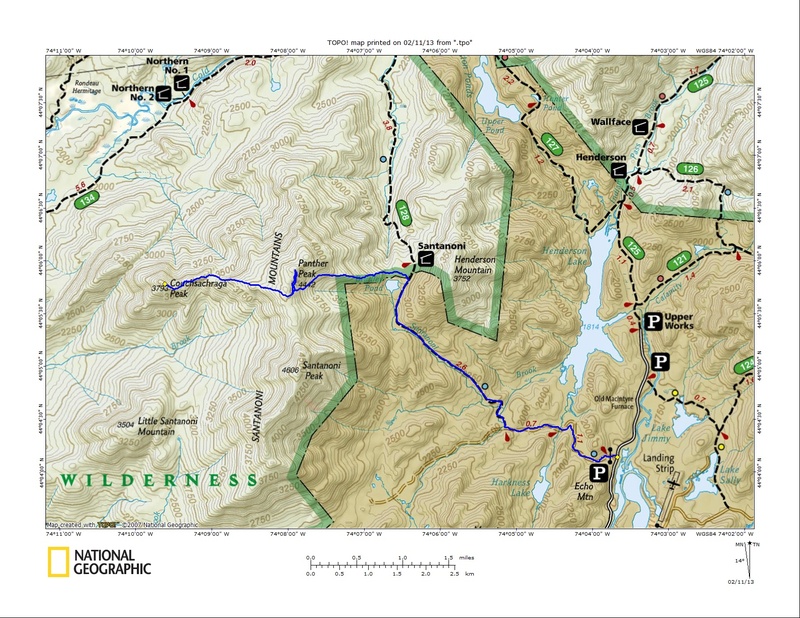 See caltopo.com. I then just did a screen capture of the screen and saved it as a jpg. 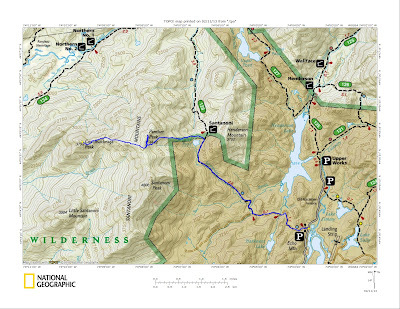 I really like Caltopo for the various map combinations. I haven't tried Garmin Base Camp, although I may check it out. Another mapping site I like that supplies his GIS data is aprgis.org. 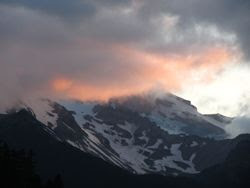 Thanks - the CalTopo site offers some additional topo options not available in Basecamp. However, I wish program offered option to export directly to a jpeg or tiff rather than screen capture. APRGIS site also seems nice but haven't figured out how to upload gps data to site. Is this possible? No, it's just a viewer.